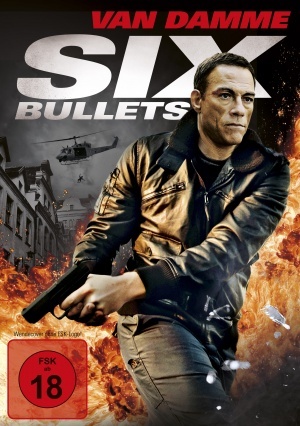 Six Bullets is a American action film starring Jean Claude Van Damme , it was produced before Jean Claude did his stint in the Expendables 2 , but released straight to DVD in September 2012 ,just after Expendables 2 hit the cinemas . Now Jean Claude of late has been making some quite good action fare , I enjoyed Assassination Games and would say since the 2007 film Until Death Jean Claude has got back into making good films which suit him in this time of life ,it's also given him a chance to explore his acting to a greater degree. 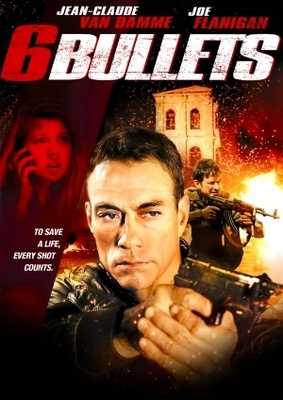 Six Bullets is no different ,it is a very good film for a straight to DVD release ,in fact it had been at the cinema it may have done not that bad as it is a good film and also stars Joe Flanigan of Stargate Atlantis and Dawsons Creek and Stargate SG1 . Joe Flanigan plays a MMA fighter Andrew Fayden who has to go to a East European country to take part in a match. Along with his wife and daughter they arrive at the airport where it seems his daughter has been targeted by scouts for the mob, or someone likes taking pictures of young girls. When Andrews daughter Becky gets taken ( yes I know) the Fayden's have little time to find her before she is a blip on a map. They turn to ex-mercenary and ex-Police Man Samson Gaul (JCVD), he is known as a man who helps people by infiltrating People trafficking gangs to free those taken for sale. But after the last mission left a group of young girls dead Samson has been out of the business ,leaving the troubles to the Police and surviving by running a butchers shop . Add to this the nightmares he has and seeing the dead girls at random times of the day as he goes about his business. When the Fayden's arrive at his shop to ask for Samosn Gaul ,he turns them away saying he's not here. They realise it's him but he refuses to help . But when Andrew gets into trouble with thugs at a local bar Samson saves him and agrees to help find his daughter. Samson has little time ,as the traffickers have a buyer for American white blondes and the sale is approaching. The sadistic ringleader Vlad knows no bounds in getting the girls to do the things he wants , some are sold to high bidders while others are put on the game. Samson must infiltrate the mob to find where the girls are being held . Six Bullets crams quite a lot into it's 93min run time , as with Assassination Games the action is well put together and choreographed well. JCVD as Samson is really good as he gets to try his role as the master of Disguise ( reminding me of Bruce's disguises in Fist of Fury) also JCVD seems much more open to trying new moves which add some excitement to the events. The films also quite brutal in places and Van Damme gets to show a more sinister side like he did in Until Death. Joe Flanigan is surprisingly good in his portrayal as the MMA fighter and gets to bust some good moves on screen ,which is surprising considering he's just a actor going through the motions ,unless I'm missing something I don't know that is. Kristpher Van Varenberg JCVD soon) stars as the son of Samson in the role as some government official ,must have been easy for him though as he refers to JCVD as Dad throughout. And not missing out on the family inclusion is Bianca Bree (JCVD daughter) in a small role as one of the traffickers. Also of note is actor Louis Dempsey who plays the part of Stelu a secret service agent who know more then he lets on. Six Bullets is another entry in the action genre that deserves a watch .